It’s been too long. It’s time for a post, so let’s take a look at how I put together the Alternate cover for issue #2 of the new 6 issue minis series, Wonder Woman/Conan. The first issue just came out and readers seem to really like it. I am quite grateful for the positive response and I am hopeful that it will continue to be that way through the next 5-issues. You may be asking why I’m doing the alternate covers instead of the regular covers? 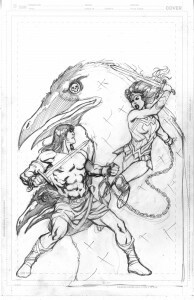 You also may be asking why not any cover to issue #1? Both are excellent questions and the simple answer is the covers were assigned before I was ever offered the job. Nutty yes, but that’s what happened. 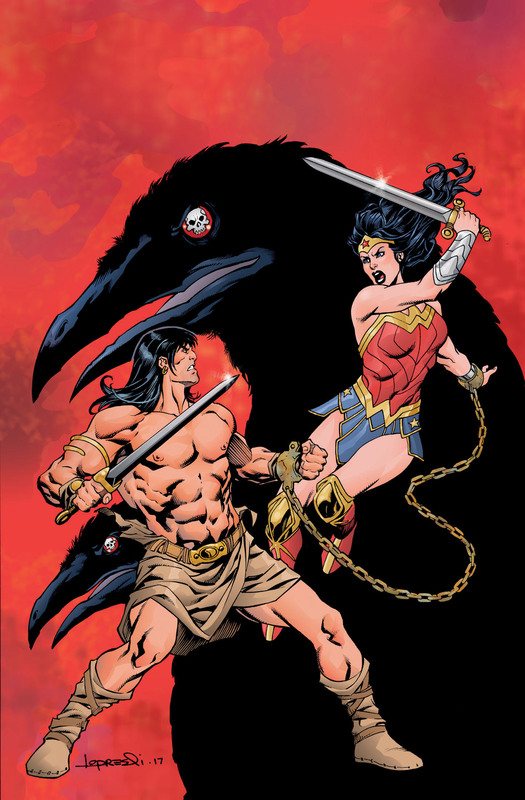 I, however, continued to complain about this arrangement to DC until they decided to do alternate covers for each issue so I would have covers to draw. I am very thankful that they thought enough of me to make this happen. The alternative cover for the first issue had already been assigned by the time I started drawing so I didn’t get my first cover until the second issue. And that ladies and gentlemen is the story. 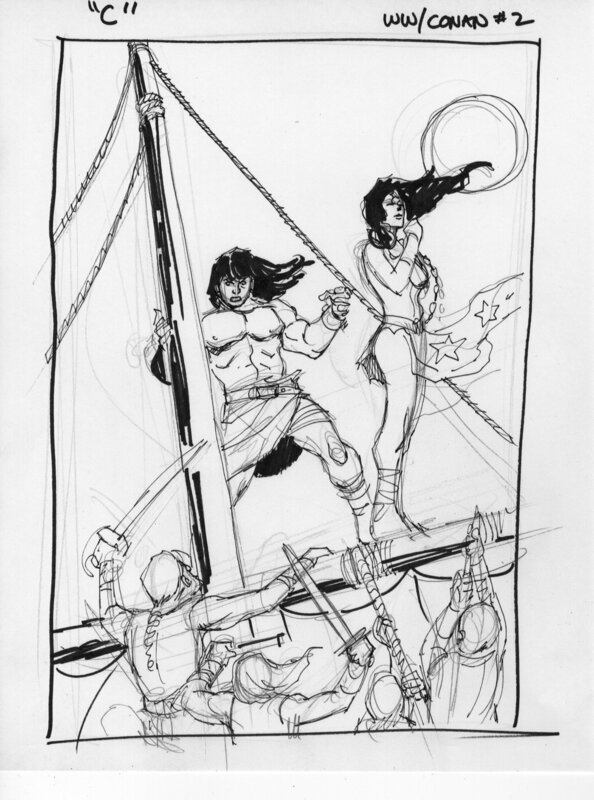 As I was working on the cover to the second issue, Dark Horse (Conan license holders) decided they wanted an image to use as a promotional print for SDCC. I got my cover finished just in time and it became the SDCC Dark Horse print. So even though the image has not been released as the alternate cover to issue #2 yet, it has been released as the print so therefore I can share it with you. Okay, I’m exhausted so let’s get to the art! 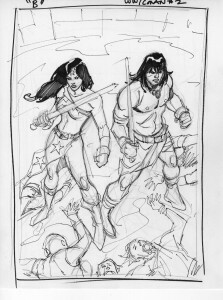 I did several roughs for this cover because I was trying to find something really cool to fit this very cool project. Also there is a lot going on in the second issue that would lend itself to a great cover. My favorites were A and E. A was chosen and I was off. 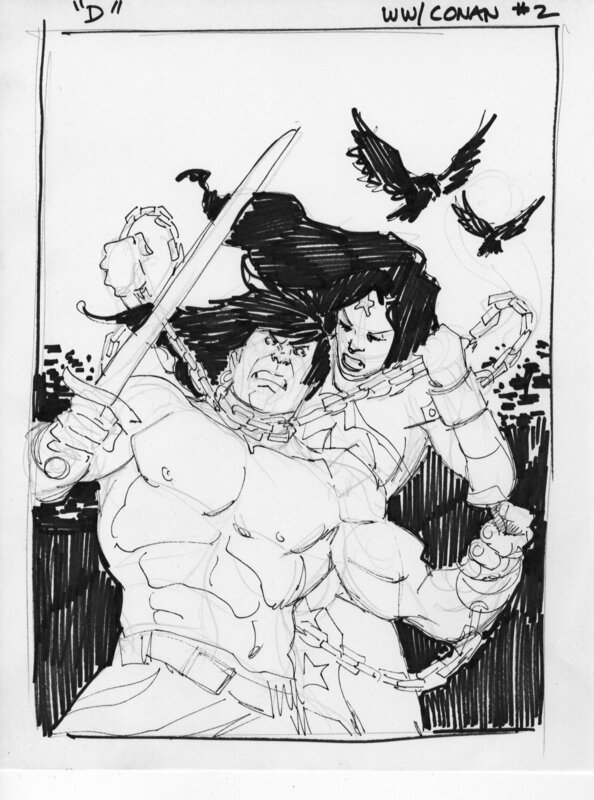 Dark Horse requested that Conan be a little more aggressive looking on the cover image so I accommodated them in the pencils. 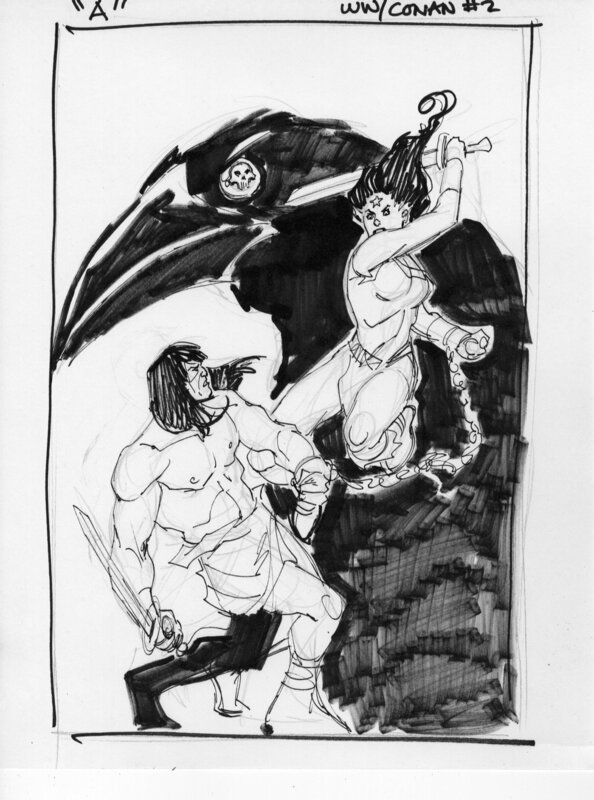 You will also see that I added a second crow head since there are two in the story. 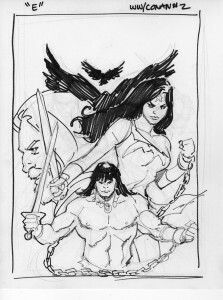 Everyone was okay with the pencils so I did what naturally comes second, I inked it. Again mostly with brush and a little pen on the straight edges and chain. Once this was done I had to jump right in on the colors because I had very little turn around time to meet the deadline for the SDCC print. My 15 year old daughter flatted the colors on this for me and she is surprisingly fast and good. Especially for her age. I wanted the background to be red so this would really jump off the stands. I incorporated some of that into the characters skin tones so it would have some color harmony. 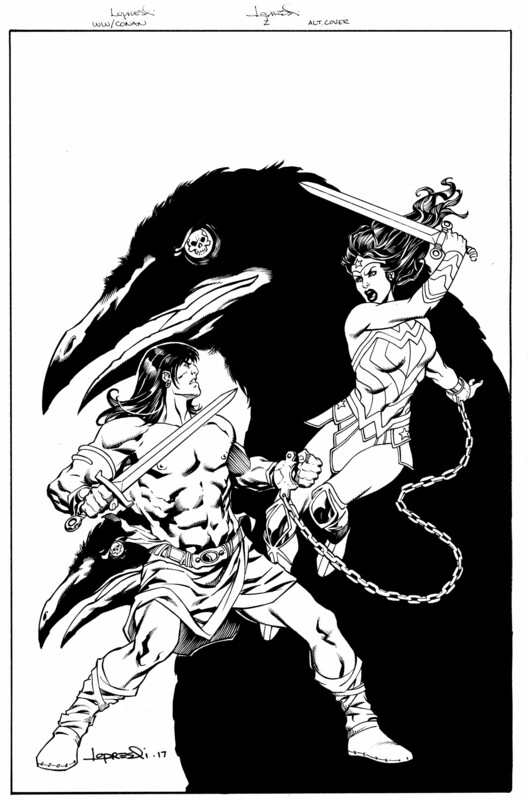 Conan has a darker more bronzed skin tone than Wonder Woman by REH’s description. The background had a little experimentation to it. I used a flat red and then used the lasso tool (photoshop) to create random looking shapes and then did a color fade inside the lasso. This helped create the splotchy look to the background. I did multiple fades over some of those so that they blended more organically and then added some soft brush spotting over the top creating a faux water color effect. Then things got interesting. About a month after the print was released Dark Horse let me know that Conan was holding his sword wrong! What? 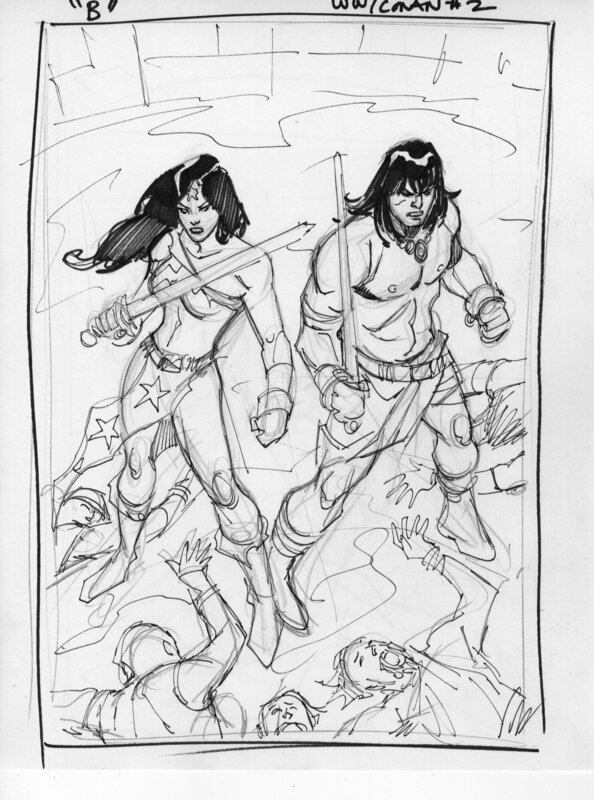 I was wondering where this information was in the penciling stages. However, such is the life of a commercial artist. I had to figure out a way to patch in some new black and white art into the color file without re-coloring the whole thing. I penciled and inked the sword correction. The flat side of the sword should be lined up with the back of Conan’s hand. The outline of the hand is just there as a guide. I was only going to use the sword and it’s hilt. I scanned it and then pasted it in the black copy layer (I’m coloring in CMYK channels). Then erased the parts of the old sword that were still showing. 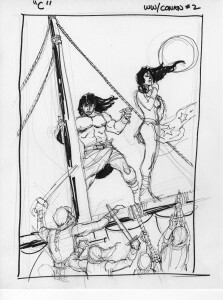 This in turn created areas on Conan’s chest and arm that were now uncolored. so I went in and did some touch up and saved the day. It felt like the old days when I was working in a commercial art studio in Portland. Creating patches to correct art was one of my specialties. Of course, I had no computer help back then. So there it is, the final final art. You’ll notice I got a wild hair and added some light flares to the swords. I’m also particularly fond of the chain. I took a brush with very random edges (again in photoshop) and applied splotches of color at about 30% opacity to create a rusty metal look. This blog is admittedly a bit long-winded but it does offer up some insights into the problems we sometimes run into with comics and commercial art in general. 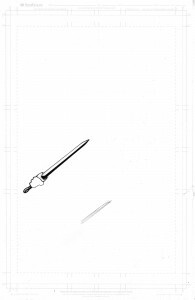 Thanks for the detailed explanation of the final cover art. I didn’t know about the series until seeing this, so now I’ll go out and buy it – assuming I find the alternative cover in my local shop. There is no cover by me on the first issue. 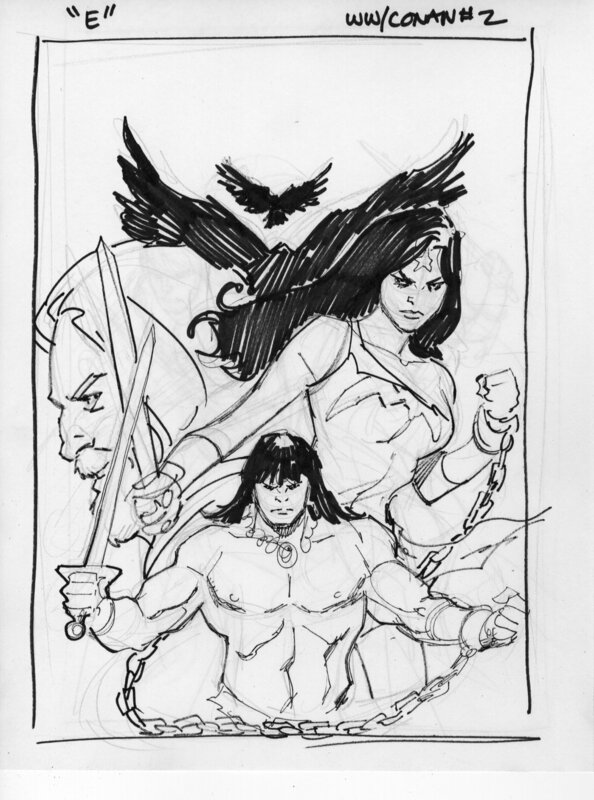 There is a sketch cover available, however…. Excellent first issue! You and Gail make a great team. If you still have the prelim for this cover email me the details.